The Keystone View Company dominated the stereoview market after acquiring the negative stocks of H.C. White in 1915 and Underwood & Underwood in 1921, effectively making them the last major publisher of this once immensely popular form of home entertainment and education. Even though the development of “nickelodeons” and larger cinematic theaters would become the preferred form of “virtual travel” for most Americans through the early twentieth century, Keystone remained in operation through the 1970’s, long after the business’ highest commercial sucess. Keystone had long emphasized the educational virtues of their products, regularly imprinting detailed descriptions on the reverse of their mounts or offering booklets with narrative accounts as accompaniments to their larger sets. In the 1920’s Keystone started offering massive 400 and 600 “World Tour” sets, both of which contained older images of late Meiji-era Japan, photographed between approximately 1896 and 1906. In 1935/6, Keystone unveiled its most audacious product to date, a monumental 1200-view “Tour of the World” set, weighing around 70 pounds with all of its cards and accoutrements. This Keystone set was the first to incorporate newly photographed images of Japan in two decades, all taken by an unknown photographer. This final Keystone view of the Daibutsu would emerge as its most famous. Leering in from the right side of the photograph is a white hand-painted sign plainly stating, “No Photographing Allowed Here.” By photographing this sign, our unknown photographer lays bare the long-standing tensions between tourists and the temple. For many travelers, the only reason to visit the Kamakura colossus was precisely to have their image taken, sometimes perched in his lap, as a sign of their conquest of the Orient. The infrequent, interpid Yokohama globetrotter of the 1860’s had ballooned into the large-scale tourist excursion parties of the early 1900’s, promoted by a thriving tourism industry. By the 1930’s, the temple had decades-old regulations limiting amateur photography, and several Western travelogues describe the difficulty in procuring a good image of the Daibutsu, sometimes needing to distract the temple priet in order to surreptisiously take a quick photograph. 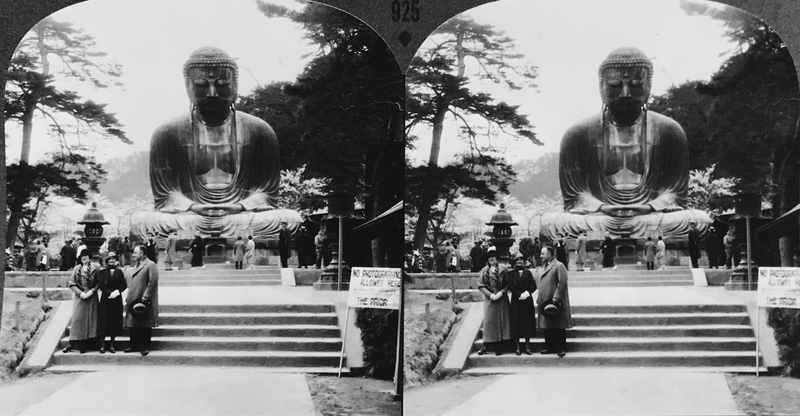 With the rules not permitting closer access with camera equipment, this late-issue Keystone image frames the Great Buddha at a greater distance than most stereoviews. Visual attention is directed to the foreground where three Western tourists stand with their backs towards the Daibutsu. With two women posed formally and a man holding his hat looking to the side, a crowd of Westerners is also seen touring the grounds behind them. A single Buddhist priest can be found strolling among the onlookers. The Daibutsu functions as a backdrop to the visual narrative centering on the three tourists. The statue efficiently signals the Otherness that envelopes the tourists throughout their foreign adventures. While many facets of their trip are the same as home, some things are wildly out of step with their norm and those are precisely the things that need to be seen. This photographic souvenir proves their success in capturing the exotic Other. Unlike the numerous stereoviews published previously, little visual focus is placed on the activities of the native Japanese; the sole priest walks casually, unaffected by the religious icon. The caption, too, supports a focus on tourist activities, noting this visit took place during “Cherry-Blossom Time,” a period optimal for camaraderie, sightseeing, and picture taking. The description on the mount’s reverse cribs from the older Underwood & Underwood card, updating the preferred mode of transportation from rail to “motor car” and mentioning the Greant Kantō earthquake of 1923. Harkening back to the magnificent past of Kamakura and noting the immense dimensions of the Daibutsu, the reader is afforded the necessary contextualizing elements that make the “virtual tour” even more realistic. The last sentence dramatically underscores the appeal of the location, almost as if a pitch delivered in a travel magazine or tourist brochure: “This great Buddha is one of the most dramatic sights in Japan and is said to be the largest bronze statue in the world.” This fact would be all the more apparent for the numerous tourists who made the trip, both virtually and in real life. Although many images were looted in the intervening years, the remaining Keystone stock was donated to the California Museum of Photography, at the University of California, Riverside, and catalogued as the Keystone-Mast Collection. The contact print of the above stereoview is identified as 1996.0009.33903.SS.